The following positions on the Building Enclosure Council of Iowa’s Board of Directors are available for terms commencing on November 16, 2018. Must be a paid member for 2019. Click here to complete the membership form and pay 2019 annual dues. 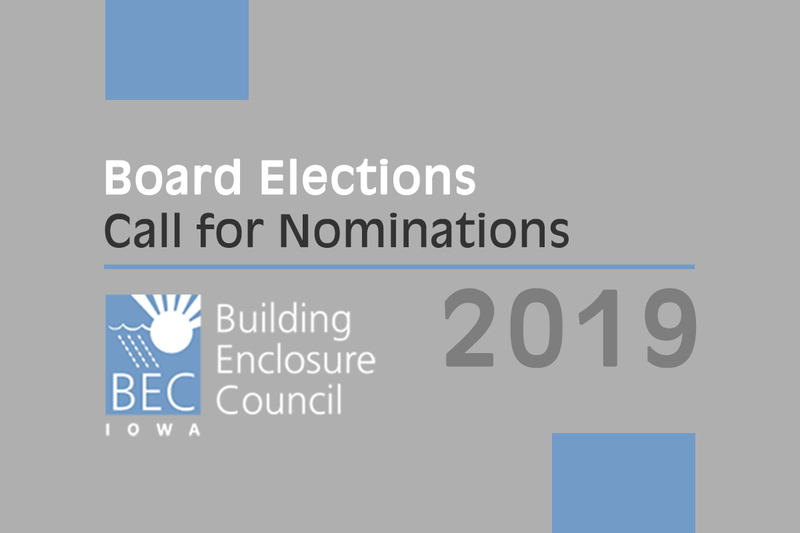 Candidates interested in running for either of the board positions should submit the following information to the Building Enclosure Council of Iowa at contact@bec-iowa.org. The deadline for nominations is October 17, 2018. The Board of Directors will meet to review the qualifications of each submittal and prepare a slate of candidates to be listed on the 2019/2020 ballot. Elections will occur on Friday, November 16, 2018, at the Annual Members Meeting.